After the duel between Saruman and Gandalf in which Gandalf is bested, he is sent to stay on the pinnacle of Orthanc. 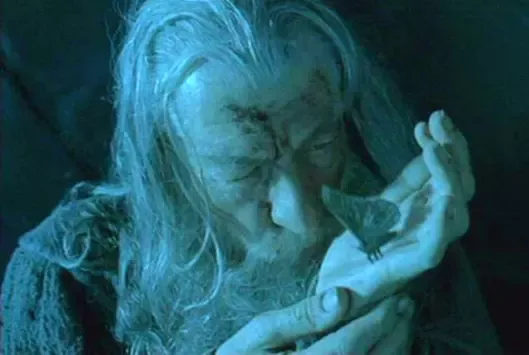 Gandalf then whispers a message to a moth that happens to appear. I know that the message involves the calling of an eagle, for that becomes obvious ten minutes later. However, what exactly does Gandalf say to the Moth in the Elvish tongue? Apparently, Gandalf says: "Gwaihar − go!" The aforementioned moth does not appear in the books, so an answer from book-canon is non-existent. I checked multiple scripts of Peter Jackson's The Fellowship of the Ring online, and I've gotten varied results. Low angle...looking up at ORTHANC...the tower of Isengard, gleaming in the moonlight. The camera rises to reveal the once beautiful gardens are not a pitted wasteland...with smoke and fire billowing out of numerous tunnels and vent holes that litter the forecourt of ORTHANC. Strange guttural chants echo up from deep underground. The camera is rising...a small moth flutters into shot...and leads the camera towards the summit or Orthanc. Gandalf lies slumped against the wall at the very top of Orthanc, surrounded by a sheer 500 foot drop. He looks Weak and Frail...and is seemingly asleep. The MOTH flutters close to Gandalf. His hand suddenly moves at lighting speed and SNATCHES THE MOTH. Gandalf brings his hand close to his face and opens it. The moth sits on the palm of his hand as Gandalf mutter strange words in a foreign tongue. Close on: THE MOTH'S face... seemingly listening. Isengard is now surrounding by deep ravines in the ground, which glow orange. Wooden structures stand around the ravines. Inside the ravines, wooden walkways and pulleys have been built, where hundred's of orc are working. A moth flies over the caverns to the top of Orthanc, where Gandalf sits dozing. As it flies past him, he quickly reaches out a hand and gently grabs it. Gandalf whispers "Gwaihir" repeatedly to a moth that arrives at Isengard. Later, Gwaihir rescues Gandalf from Isengard, and carries him to safety. You can watch the scene and judge for yourself whether Gandalf says "Gwaihir" or is just talking gibberish. I, personally hear only a very muffled "Gwaihir", but the "go" is there. How did Gandalf get his staff back after being captured by Saruman in Orthanc? Does Gandalf die in the Undying Lands?